The Ferris wheel hire or the Big Wheel hire as it is also known as, is one of the most popular fairground rides we have. It is really like a mobile London Eye, but was around long before this. The ”Ferris wheel hire” is a great attraction, guests climb into their seats and are taken on a vertical ride at a leisurely pace. When their gondola is at the top the riders get a bird’s eye view of the surrounding area. We hire Ferris wheels throughout the UK and are one of the most popular fairground rides around. The rides originated in the USA in the late 1800s and have been a regular fairground attraction ever since. The Ferris wheel hire is a great piece of equipment as it appeals to all guests, whether the ladies are in their best ball gowns they can still enjoy this fun ride. Why not hire another high adrenaline ride to complement the Ferris wheel then you will have something for all the guests? We hire all the fairground rides and they are all very popular. We also supply all the fairground side stalls and games and we can create the perfect fun fair at your venue. The big wheel ride and the Ferris wheels are some of the most popular fairground rides we have. When you hire ferris wheel fun, your guests climb aboard and they are gently taken upwards around the huge wheel. These are traditional fair rides, we also have the modern white knuckle rides available. The traditional fair ground rides like the Carousel and the Ferris wheels are still some of the most popular. Our fair ground hire is available throughout the UK and we offer the best corporate funfair ride hire around. The fairground ride hire is great for all ages. Our funfair hire is often accompanied with the fun inflatable hire and the other games we have. The fun fair hire is very bust during the summer months. 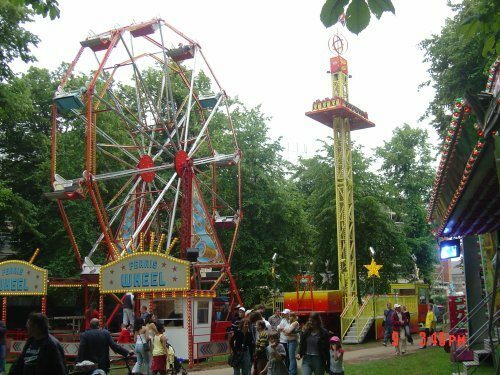 Hire fairground rides and you will have a great event. Hire funfair rides now. Ferris Wheel hire is a great attraction at any event. We also supply all the inflatable fun games and other interactive entertainment so can organise your whole event for you. We hire Ferris wheels to a wide range of clients from military bases to company fun days and they are always well used, the great thing with the Ferris wheel is that it is trailer based so sets up very quickly, you will also get through a great number of guests as the rides can be as long or as short as you want. This is a great attraction to any event and will certainly keep all your guests occupied. Ferris wheel hire is great for balls, proms and parties.